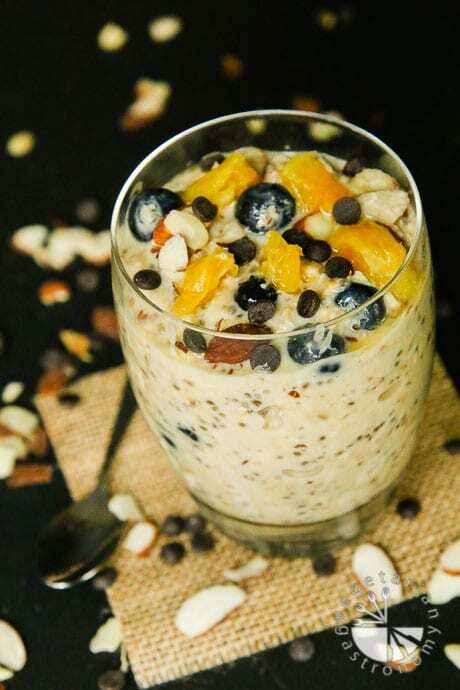 Overnight Oats have become one of my families all-time favorite breakfasts! Simple prep the night before, leading to a delicious, healthy, satisfying, grab-and-go breakfast the next morning. Who doesn’t love the sound of that?! 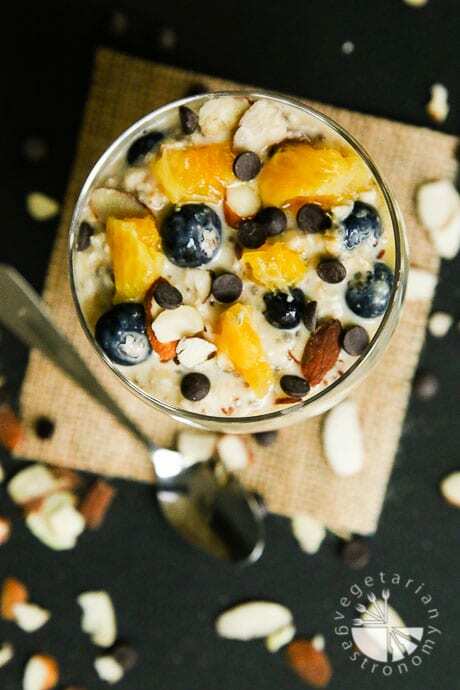 Since my Chocolate Strawberry Almond Overnight Oats were such a huge hit (if you haven’t tried it yet, you are missing out), I decided to create another wonderful combination…Orange Blueberry Vanilla Overnight Oats. I came up with this amazing combination when thinking of ways to use all the wonderful sweet home-grown navel oranges my mom and in-laws kept delivering whenever they visited the last few months. Of course our number one way to use them is simply making freshly squeezed orange juice, but after boxes and boxes of sweet large navel oranges, I knew I had to come up with a few creative recipes using them, two of which I’ve already posted – my Orange Coconut Blueberry Green Smoothie and Orange Julius Popsicles. This recipe is a delightful combination of freshly squeezed orange juice, blueberries, almonds, and some vanilla extract. I decided to sweeten these overnight oats with bananas and a tiny bit of pure maple syrup (which you can easily omit). Of course, as always, I like to pre-process my oats in my Vitamix so that they are coarsely grounded. This, in combination with chia seeds, makes for a creamier texture. To make the prep easier, I typically process a bunch of oats at once and keep a stock of them in my pantry. 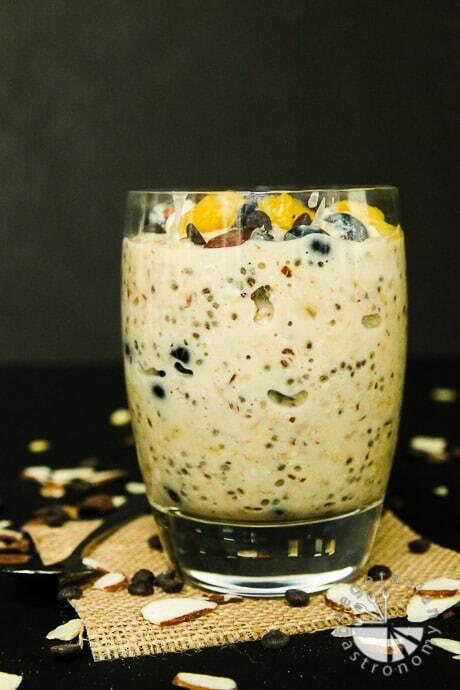 Add in the other usual healthy ingredients, top it off with some almond milk, and you have yourself another delicious dessert-like overnight oat combination! Stay tuned for a few more orange-inspired recipes coming to the blog soon! It’s always wonderful to hear from my readers and followers in the comment section below. 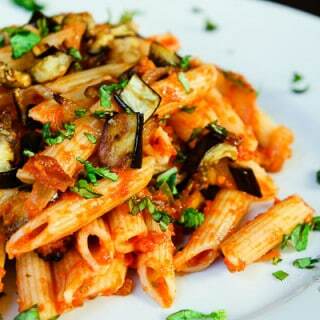 So if you make this recipe or even simply like the idea of the recipe, I’d love to hear from you. It’s also a great way for me to get feedback so that I know how you like the recipes, whether you are eating or making them. You can give any feedback below, or you can also tag me on Instagram if you make one of the recipes @vegetariangastronomy , #vegetariangastronomy, so I don’t miss it. 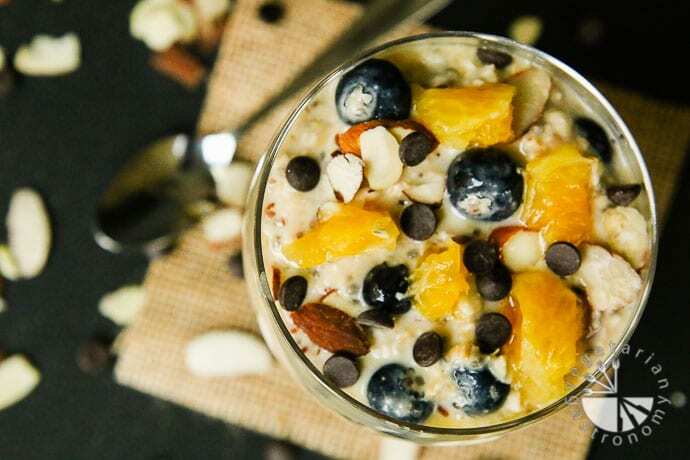 Breakfast never tasted better with this grab-and-go overnight oats recipe! Fresh flavors, 10 minutes to prep, and the perfect way to start your morning! In a mixing bowl, whisk together the processed oats, ground flaxseeds, chia seeds, and a pinch of salt. Add in the rest of the ingredients (except for the chocolate chips) and completely mix together. Cover the mixing bowl and place in the fridge overnight. The oats should be ready the following morning! Serve cold or warm them up (I prefer cold). Feel free to adjust the sweetness (with maple syrup or bananas) or consistency (with additional almond milk). 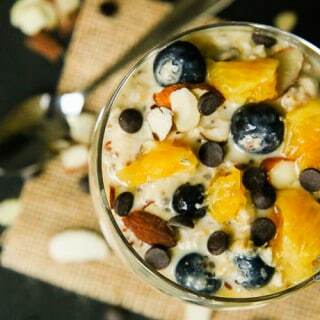 If desired, top the overnight oats with some additional blueberries, almonds, and/or cut pieces of fresh oranges. Top with some dark chocolate chips and enjoy! To Make Coarsely Grounded Oats - Place whole rolled oats in Vitamix or food processor. Lightly pulse for a second, a few times to slightly process them or coarsely 'chop them up'. Be sure not to process them down into a flour-like consistency. For the recipe above, measure out 1 cup of these processed oats. To make things easier, I like to do this in bulk ahead of time and keep a stock of coarsely grounded oats for use in my overnight oats. Aren't overnight oats awesome?!? I so wish EVERY morning when i forget to make them, that I had them to eat! I love them...the chocolate strawberry ones are my favorite as well...the kids think it's dessert seriously. If he loves chocolate he will love them! And if you don't have strawberries, I've simply added any other fruit (blueberries, raspberries, or even bananas mashed or pieces). If you add mashed bananas to the oats, then you don't need to even add maple syrup to sweeten! Let me know how he likes them! 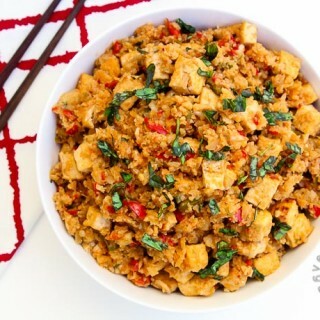 Ok...I'm craving these for dinner now =) Thanks for letting me know...love the comments! 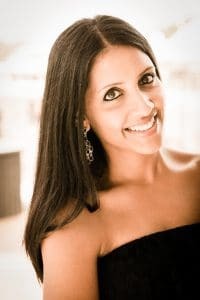 Hello, I'm a newbie to the vegan world or should I say researching for health reasons before I can commit. My question is you don't cook the oats at all? I grew up on oatmeal and love it, but for some odd reason when I eat oatmeal now I get a terrible headache. However I really would like to try your recipe. Very easy to masked and ready to go in the morning. Kids love it too. Overnight oat is very good. No rush in the morning. Right?? Love overnight oats. My chocolate one is definitely dessert in the form of easy breakfast.